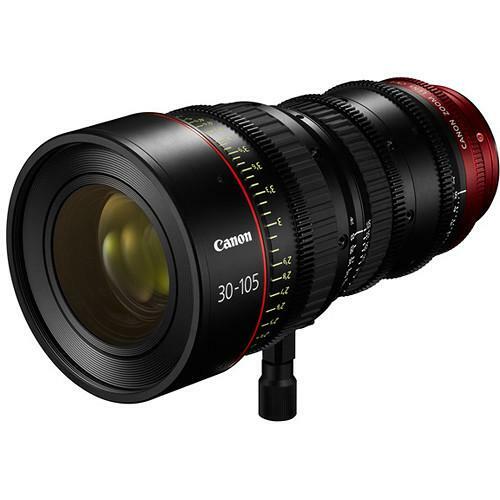 We recommend checking out our discussion threads on the Canon PL-Mount CN-E 30-105mm f/2.8 L SP/MOD Digital 7623B005, which address similar problems with connecting and setting up Digital Cine Lenses Canon. The user manual for the Canon PL-Mount CN-E 30-105mm f/2.8 L SP/MOD Digital 7623B005 provides necessary instructions for the proper use of the product Professional Video - Lenses & Lens Accessories - Digital Cine Lenses. The Canon PL-Mount CN-E 30-105mm f/2.8 L SP/MOD Digital Cinema Zoom Lens provides impressive zoom magnification and wide-angle focal length range for the Super 35mm format. It is engineered to offer 4K optical performance for demanding high-end productions, meeting and exceeding industry standards. Intended for the working professional, the lens has markings on angled surfaces and on both sides of the barrel, making it easy to read settings from behind, or from either side of the camera. Focus markings can even be switched from standard labeling to metric, depending on production needs. This lens is equipped with control rings designed to maintain the proper amount of resistance with consistent operating torque, and a covered flange-back adjustment mechanism to meet numerous of production application needs. Designed to fulfill contemporary 4K production standards, this lens surpasses the performance requirements of any HD imaging system. It features advanced optical design with fluorite and large aspherical lens elements to achieve sharp, consistent images throughout the zoom range. It also incorporates geared inner focusing to minimize focus-induced changes in the angle of view, reducing focus breathing virtually to zero. The innovative glass construction counteracts barrel expansion and contraction to avoid temperature-induced marking discrepancies. The Cinema Zoom lens offers impressive optical performance for demanding high-end productions. Light and small in size, the lens offers consistent a form factor and markings optimized for motion picture production. Sharing the same gear position, diameter and rotation angle, and front diameter-the lens’ compatibility with third-party accessories allows crews to easily change between any 2 lenses without making adjustments to the rig setup. The user manual for the Canon PL-Mount CN-E 30-105mm f/2.8 L SP/MOD Digital 7623B005 can be downloaded in .pdf format if it did not come with your new digital cine lenses, although the seller is required to supply one. It is also quite common that customers throw out the user manual with the box, or put the CD away somewhere and then can’t find it. That’s why we and other Canon users keep a unique electronic library for Canon digital cine lensess, where you can use our link to download the user manual for the Canon PL-Mount CN-E 30-105mm f/2.8 L SP/MOD Digital 7623B005. The user manual lists all of the functions of the Canon PL-Mount CN-E 30-105mm f/2.8 L SP/MOD Digital 7623B005, all the basic and advanced features and tells you how to use the digital cine lenses. The manual also provides troubleshooting for common problems. Even greater detail is provided by the service manual, which is not typically shipped with the product, but which can often be downloaded from Canon service. If you want to help expand our database, you can upload a link to this website to download a user manual or service manual, ideally in .pdf format. These pages are created by you – users of the Canon PL-Mount CN-E 30-105mm f/2.8 L SP/MOD Digital 7623B005. User manuals are also available on the Canon website under Professional Video - Lenses & Lens Accessories - Digital Cine Lenses.